Lessons from the brouhaha over the preparations to war against Iraq openned its doors to the revelation of the method USA spy agencies deceptively rely on Counsel Generals and/or Ambassadors stationed in Africa to spy on the sub-Saharan region of West Africa Countries such as the Republic of Niger. This was as USA spy agencies dispatched Ambassador Wilson and wife, a CIA operative, to Republic of Niger under the guise of Ambassadorial posting to Niger Republic. Later, it was discovered the pair were sent to investigate the alleged transfer of “Yellow Cake” to Niger from Iraq. Nigeria presently finds herself at the same junction where the Niger Republic found herself before the Iraq war. Ukpakareports.com learnt from principal sources of the heightened interest the USA spy agencies developed over Nigeria following the ramp up in activities in the Niger Delta and the likelihood of a return for military rule and/or secession. These interests or concerns drove the USA government into re-dispatching Ambassador Brian Browne to Nigeria to serve as Ambassador in 2004. He's third posting to Nigeria. He was first posted to Lagos, Nigeria in the late eighties and early nineties during the time of military rule. He was in Abuja at the turn of the millennium during the transition to democracy. And in 2004, he returned to Lagos to serve an additional three years at the Consulate General. At the expiration of the posting in 2007, he returned briefly to his home country only to reappear in Nigeria as the Executive Director of the newly formed Ken Nnamani Centre for Leadership & Development in Abuja. Mr. Browne attended the National War College [in USA] from 2003 to 2004 where he received a M.SC in National Security Strategy. He was born February 8 in Huntsville, Alabama and resides in West Palm Beach, Florida. Sources with the Nigerian presidency believe Mr. Brian Browne to be a spy for the United States of America. The source, who sits at an Executive position in Abuja, categorically told correspondents of Ukpakareports.com the open secret within the executives of the federal government in Abuja of Mr. Browne's undercover operations in Nigeria. The source notes that while Mr. Browne served as a diplomat, the executives of the federal government looked away from his clandestine and/or spy activities. 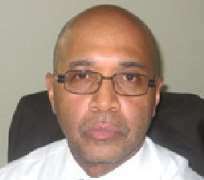 However, his return to head the Ken Nnamani's center for leadership and development has agitated them. As gathered from insiders within the power-players in Abuja, the period when General Olusegun Obasanjo's quest for a third-term presidency raged and the upper and lower House of Representatives were divided - planted the seeds that resulted in the formation of the Ken Nnamani's Center. Ken Nnamani, as can be recalled, sat at the seat of the Senate Speaker and was the third citizen - thus by virtue of his position was the third in line of power succession. So as General Obasanjo plotted his return as a third term president and waged battle against his vice president, Abubakar Atiku, the then Senate president saw an opening to strike. At the time, Obasanjo and Atiku were engaged in a no holds bar fight for the 2011 seat that threatened adverse affects to the 2007 presidential elections. And Ken Nnamani saw the chance to offer a solution to the quagmire. Ken Nnamani immediately proposed to have the 2007 elections postponed and power handed over to the Senate President – who would then oversee the 2007 presidential elections. The proposal was taken to the Chairman of Independent National Electoral Commission [INEC], Prof. Maurice Iwu for discussions and “approval”. Unfortunately for the Senate President, the INEC Chairman could not buy into the idea. Sources close to Prof. Maurice Iwu told Ukpakareports.com that the INEC Chairman was not comfortable with the idea of what the remainder of Nigerians would perceive it as. He feared that it would be viewed as an Igbo plot to take over leadership of Nigeria. Ken Nnamani saw Prof. Maurice Iwu's refusal as blow to his political/presidential aspirations. And thus, he felt annoyed at the INEC Chairman and moved to launch a campaign of calumny against INEC. But the campaign could not take off as planned because Ken Nnamani discovered immediately he was knee-high in most of the ills he wanted to expose of the INEC. Ken Nnamani's companies had been awarded lucrative contracts by the INEC of which he collected money but never delivered on. So his campaign quenched. Determined to achieve his dream of becoming the President of Nigeria, and as his term at the Senate ended, Ken Nnamani launched the vehicle that he believes will position him for the office. And the vehicle launched was the Ken Nnamani Center. Immediately following the launch, the former Ambassador, Brian L. Browne, returned from Florida, USA to visit with Ken Nnamani at his Maitama [Abuja] home in Nigeria. The former Nigerian Ambassador was made in charge of the Center. Through this, Mr. Browne [a spy] became charged with the training of Nigerian leaders of tomorrow. The question becomes to what reason would a USA trained spy seek/gain employment at a non-governmental organization for the purposes of training Nigerian leaders?